There’s quite a bit of stuff to process in this post, but i’ve got rid of as much maths as possible and put in lots of pictures. First of all Principal Component Analysis is a good name. It does what it says on the tin. PCA finds the principal components of data. The data isn’t very spread out here, therefore it doesn’t have a large variance. It is probably not the principal component. On this line the data is way more spread out, it has a large variance. In fact there isn’t a straight line you can draw that has a larger variance than a horizontal one. 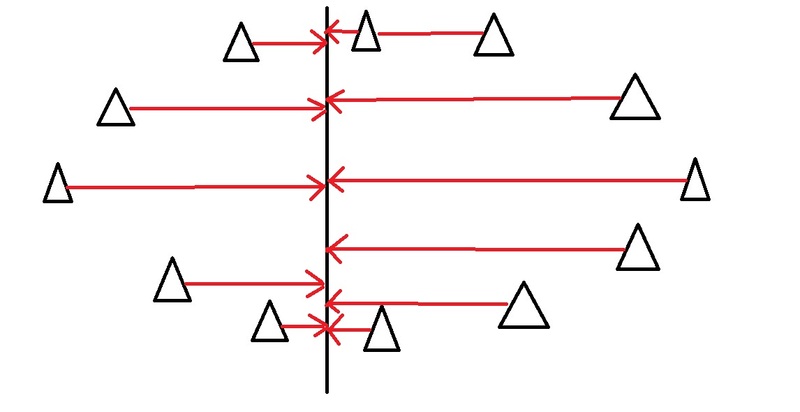 A horizontal line is therefore the principal component in this example. Luckily we can use maths to find the principal component rather than drawing lines and unevenly shaped triangles. This is where eigenvectors and eigenvalues come in. 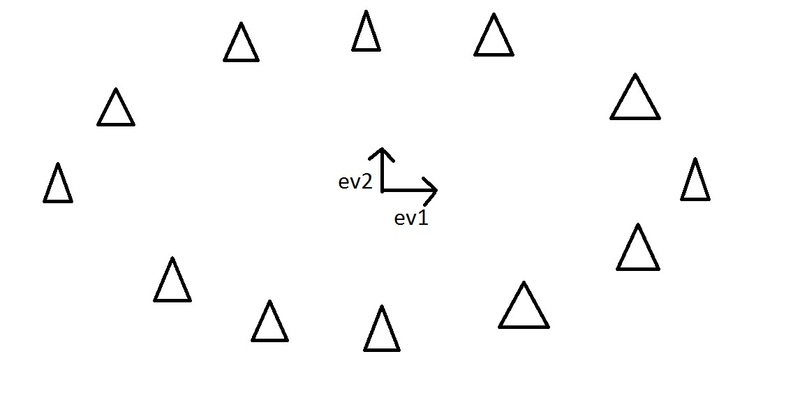 When we get a set of data points, like the triangles above, we can deconstruct the set into eigenvectors and eigenvalues. Eigenvectors and values exist in pairs: every eigenvector has a corresponding eigenvalue. An eigenvector is a direction, in the example above the eigenvector was the direction of the line (vertical, horizontal, 45 degrees etc.) . An eigenvalue is a number, telling you how much variance there is in the data in that direction, in the example above the eigenvalue is a number telling us how spread out the data is on the line. The eigenvector with the highest eigenvalue is therefore the principal component. Okay, so even though in the last example I could point my line in any direction, it turns out there are not many eigenvectors/values in a data set. In fact the amount of eigenvectors/values that exist equals the number of dimensions the data set has. 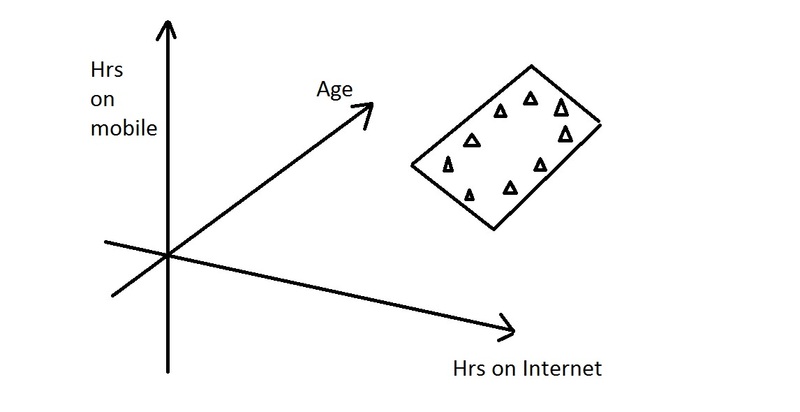 Say i’m measuring age and hours on the internet. 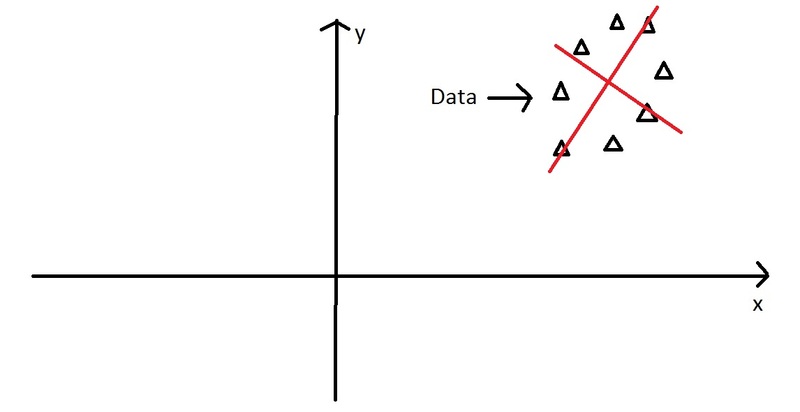 there are 2 variables, it’s a 2 dimensional data set, therefore there are 2 eigenvectors/values. 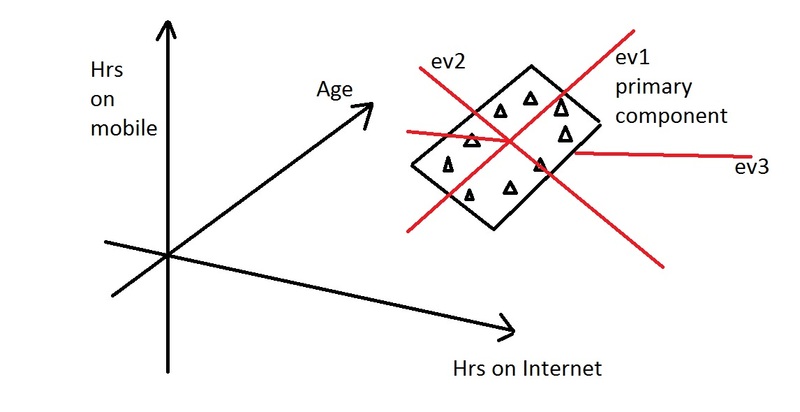 If i’m measuring age, hours on internet and hours on mobile phone there’s 3 variables, 3-D data set, so 3 eigenvectors/values. The reason for this is that eigenvectors put the data into a new set of dimensions, and these new dimensions have to be equal to the original amount of dimensions. This sounds complicated, but again an example should make it clear. Note that nothing has been done to the data itself. We’re just looking at it from a different angle. So getting the eigenvectors gets you from one set of axes to another. These axes are much more intuitive to the shape of the data now. These directions are where there is most variation, and that is where there is more information (think about this the reverse way round. If there was no variation in the data [e.g. everything was equal to 1] there would be no information, it’s a very boring statistic – in this scenario the eigenvalue for that dimension would equal zero, because there is no variation). But what do these eigenvectors represent in real life? The old axes were well defined (age and hours on internet, or any 2 things that you’ve explicitly measured), whereas the new ones are not. This is where you need to think. There is often a good reason why these axes represent the data better, but maths won’t tell you why, that’s for you to work out. 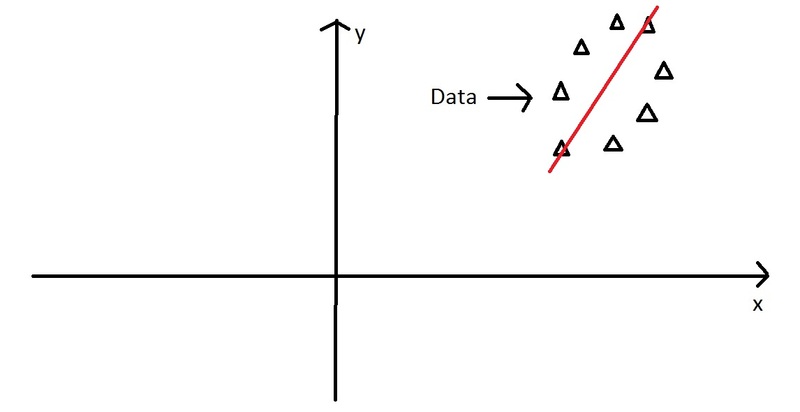 How does PCA and eigenvectors help in the actual analysis of data? Well there’s quite a few uses, but a main one is dimension reduction. PCA can be used to reduce the dimensions of a data set. Dimension reduction is analogous to being philosophically reductionist: It reduces the data down into it’s basic components, stripping away any unnecessary parts. When we find the 3 eigenvectors/values of the data set (remember 3D probem = 3 eigenvectors), 2 of the eigenvectors will have large eigenvalues, and one of the eigenvectors will have an eigenvalue of zero. The first two eigenvectors will show the width and depth of the data, but because there is no height on the data (it is on a piece of paper) the third eigenvalue will be zero. 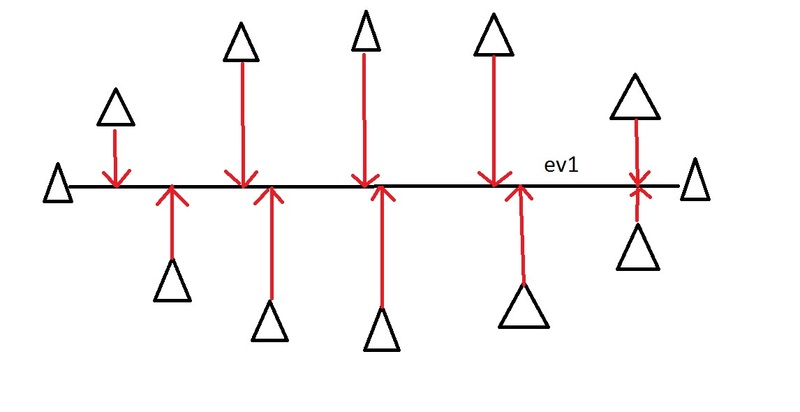 On the picture below ev1 is the first eignevector (the one with the biggest eigenvalue, the principal component), ev2 is the second eigenvector (which has a non-zero eigenvalue) and ev3 is the third eigenvector, which has an eigenvalue of zero. This is dimension reduction. We have reduced the problem from a 3D to a 2D problem, getting rid of a dimension. Reducing dimensions helps to simplify the data and makes it easier to visualise. Note that we can reduce dimensions even if there isn’t a zero eigenvalue. Imagine we did the example again, except instead of the oval being on a 2D plane, it had a tiny amount of height to it. There would still be 3 eigenvectors, however this time all the eigenvalues would not be zero. The values would be something like 10, 8 and 0.1. The eigenvectors corresponding to 10 and 8 are the dimensions where there is alot of information, the eigenvector corresponding to 0.1 will not have much information at all, so we can therefore discard the third eigenvector again in order to make the data set more simple. The OxIS 2013 report asked around 2000 people a set of questions about their internet use. It then identified 4 principal components in the data. 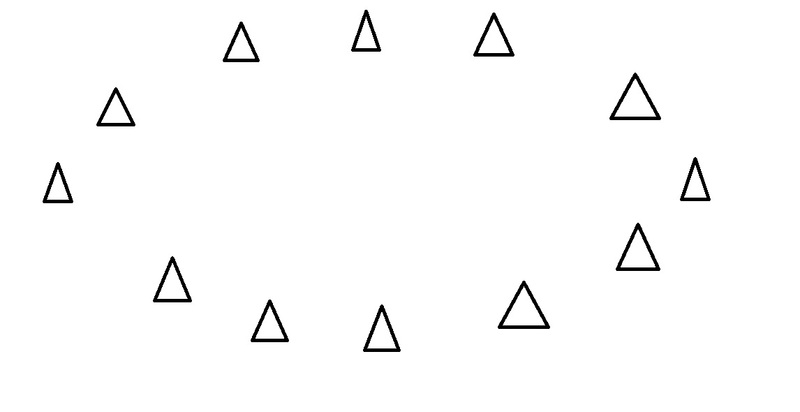 This is an example of dimension reduction. Let’s say they asked each person 50 questions. There are therefore 50 variables, making it a 50-dimension data set. There will then be 50 eigenvectors/values that will come out of that data set. Let’s say the eigenvalues of that data set were (in descending order): 50, 29, 17, 10, 2, 1, 1, 0.4, 0.2….. 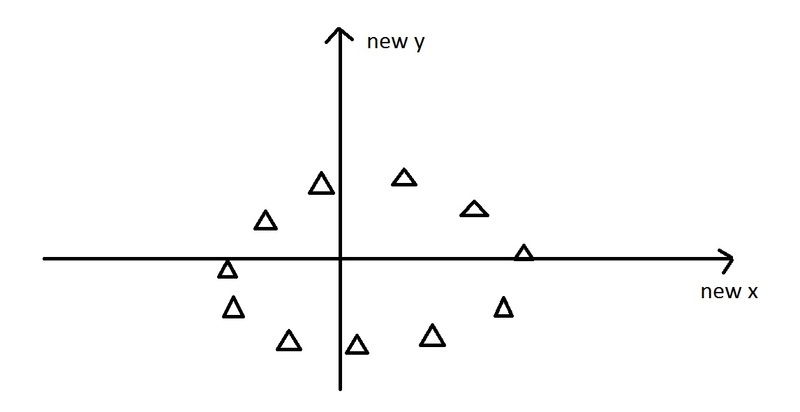 There are lots of eigenvalues, but there are only 4 which have big values – indicating along those four directions there is alot of information. These are then identified as the four principal components of the data set (which in the report were labelled as enjoyable escape, instrumental efficiency, social facilitator and problem generator), the data set can then be reduced from 50 dimensions to only 4 by ignoring all the eigenvectors that have insignificant eigenvalues. 4 dimensions is much easier to work with than 50! So dimension reduction using PCA helped simplify this data set by finding the dominant dimensions within it. Excellent! A very enlightening introduction of the concept! Oh my gosh thank you so much for this. It is very kind of you. Eigenvalues and eigenvectors are no longer intimidating to me. Neither is PCA, for that matter. I had read countless descriptions of them, all serving to needlessly confuse the issue. 1. I don’t understand how PCA is needed for dimension reduction. The eigenvalue is nothing but variation in direction of Eigne vector. So, why don’t we calculate variance in a column(dimension) and drop it from dataset if it has less variance? Is it because Eigenvalues find variation not only in x,y,z axes but also other directions? 2. In the 3-D example, we transformed the data around 2 new axes by removing third eigenvector(with 0 eigenvalue). So, what would be these 2 dimensions? How can we know which dimension the 0 valued eigenvector represents? Could you please clarify my queries? What an amazing breakdown. Thank you!! Excellent write-up! Thanks for sharing! Thank you for the explanation. It’s really intuitive. Very clear explanation of what was a confusing topic for me. Best I’ve found. Thanks! Especially when you explained the dimension reduction it seems as if each PC would correspond to one variable. But in truth each PC is just the best regression through the cloud and may or may not correlate closely with a variable, right? Maybe you could add that somewhere so that it does not trick people into thinking that PCs and variables match? Excellent article on Eigen vectors & PCA. Far best than what I have found on internet. Thank you, this is the most intuitive explanation I have found regarding PCA till date! Thank you very much man, outstanding explanation. I was struggling with eigenvalues and eigenvectors for such a long time, You made it very clear. Thank you so much!! You’re a godsent!